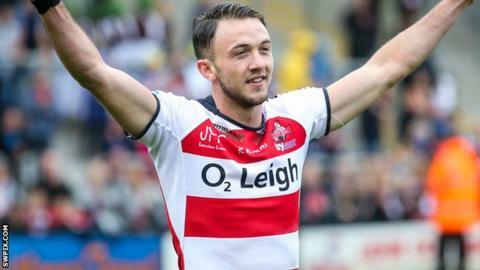 Ryan Brierley's hat-trick helped give Leigh their first win since the start of the Super 8s against Sheffield. Micky Higham opened the scoring for Centurions, but Sheffield hit back when James Davey touched down. Two Brierley tries and one from Andrew Dixon put Leigh in control, despite Scott Turner's effort for the visitors. Brierley, Liam Kay, Fuifui Moimoi, Tommy Goulden and Gregg McNally touched down after the break, while Sam Smeaton got a consolation try for Sheffield. Leigh's win keeps their hopes of reaching Super League alive. The Centurions leap to sixth place in the Qualifiers as they have a superior points-difference to Sheffield, whose own promotion chances look slim with games against Super League sides Salford, Hull KR and Wakefield to come. Leigh Centurions: McNally, Pownall, Dixon, Brierley, Emmitt, Worthington, Ridyard, Goulden, Higham, Armstrong, Moimoi, Acton, Kay. Replacements: Reynolds, Wilkes, Spencer, Aspinwall. Sheffield Eagles: Laulu-Togagae, Turner, Yere, Smeaton, Worrincy, Brambani, Aston, Battye, Carlile, Knowles, Straughier, Walker, Tonks.